Thyme is native to Southern Europe, and is very important in French “Provençal” cooking. If ever you come across the mixture “Herbes de Provence”, thyme will almost certainly be in there. Thyme bushes have green leaves that are purplish on the underside, growing on tough stems; you can just run the stem through your hands to remove the leaves, or throw the whole stem into a dish and then remove it before serving. Both fresh and dried thyme are good — thyme is one of the herbs that dries extremely well. 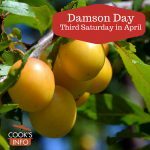 The fresh has a softer flavour, but the more dominant, stronger flavour of the dried is good at holding its own in spicy dishes and with meats. Both fresh and dried thyme stand up well to long, slow cooking, so you’ll add them at the start of cooking so that the flavour can permeate throughout the dish. There are many varieties of thyme. If you live in a temperate climate where winter isn’t severe, you may wish to grow thyme near your kitchen door as it can be cut year round. If you are growing a pot of thyme and it flowers, leave the flowers on. They are attractive, they are edible, and they are good for butterflies and bees. 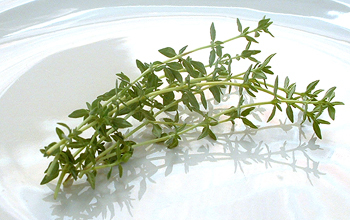 Thyme is used in the liqueur Benedictine. Many herbs are best added late in the cooking. Thyme, however, should be added at the beginning, so that its flavour goes throughout the dish. Herbes de Provence, Poultry Seasoning or Italian Seasoning (all of which contain Thyme) or savoury, marjoram, or oregano. Thyme is still used today in preparations to treat skin fungal diseases. Many cough remedies contain thymol, which is an active component in Thyme. Refrigerate for up to 5 days wrapped in a slightly damp piece of paper towel, inside a plastic bag. Or freeze using the Ice Cube trick (see Storage section under main entry for Herbs). Thyme’s name comes from “thymon” in Greek, meaning “courage”. Roman soldiers would sometimes bathe in Thyme before battle. In the Middle Ages, a woman would attach a sprig of Thyme to a knight’s tunic (by the Middle Ages, they skipped the bathing part). The Egyptians used Thyme in embalming fluid. Lull’d in these flowers with dances and delight…. — Oberon. A Midsummer Night’s Dream. Act II, Scene 1. Shakespeare.